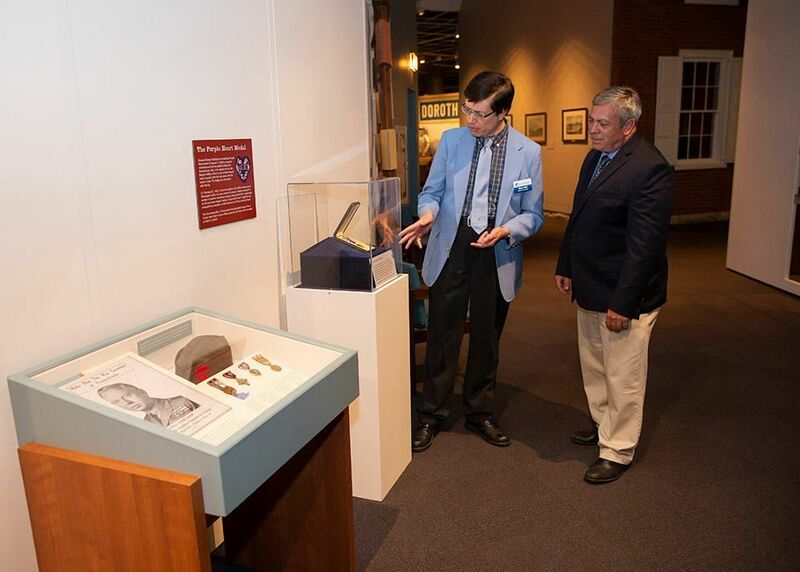 December 14, 2018 - Senator Browne (Right) is awarded the American Institute of Architects’ 2018 Government Award by Michael Metzger (Left), recognizing his work as the Co-Chairman of the PlanCon Advisory Committee. 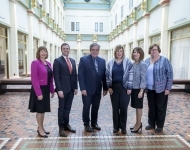 November 20, 2018 – Senator Browne helps to cut the ribbon on the Allentown Symphony Orchestra’s new Lyric Room. 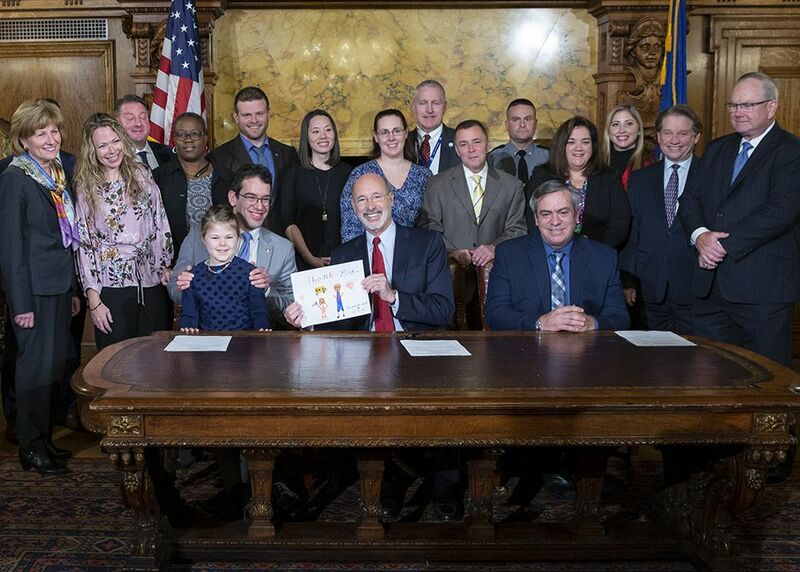 November 13, 2018 - Act 44 of 2018 established the Safe2Say program in Pennsylvania. 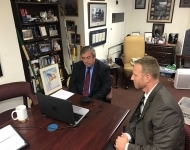 Senator Vincent Hughes (Left), Senator Scott Martin (Middle) and Sen. Pat Browne (Right) co-authored this legislation, modeling it after the successful Safe2Tell program currently employed in Colorado. Safe2Say is a school threat reporting and monitoring system for students, teachers and community residents to anonymously report any unsafe, potentially harmful, dangerous, violent or criminal activities in schools. 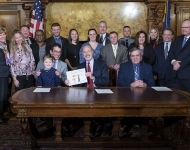 November 13, 2018 - Sen. Browne authored Senate Bill 1098, signed into law as Act 159 of 2018, permitting school bus arm cameras in Pennsylvania. 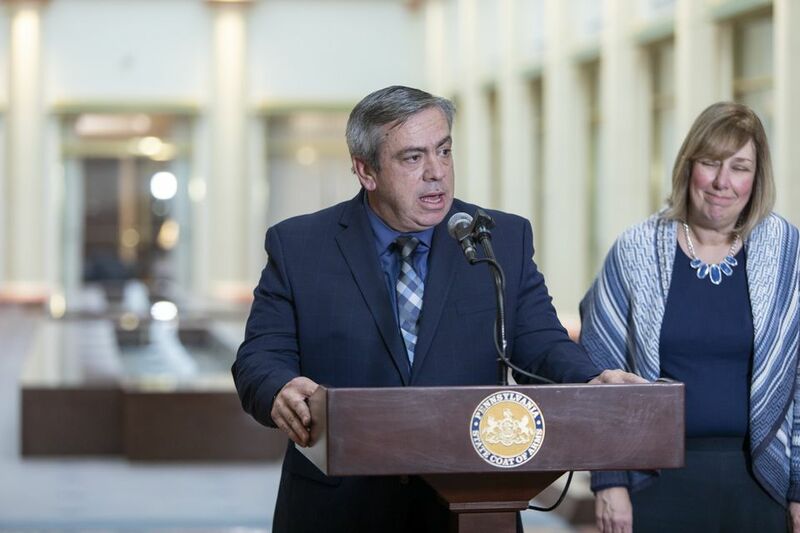 This legislation aims to help enforce the state’s current school bus passing laws and establishes a grant program to help defray the cost of the program for school districts. Pictured seated left to right: Rep. Mike Schlossberg, Oliva Clark, Gov. 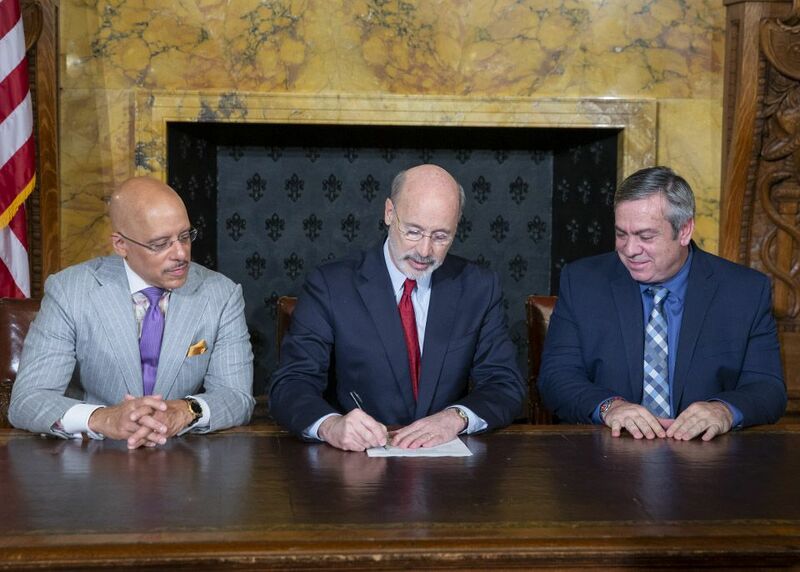 Tom Wolf, and Sen. Pat Browne. 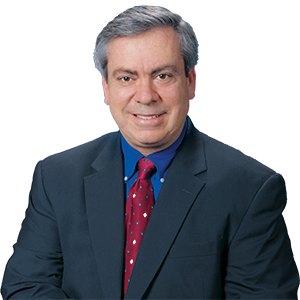 November 13, 2018 – Sen. Browne authored Senate Resolution 484 declaring November as National Diabetes Awareness Month in Pennsylvania. 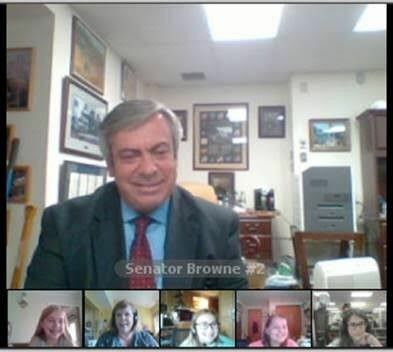 Sen. Browne was joined by Rep. Ryan Mackenzie (R-134), Dr. Terri Lipman and advocates in bringing awareness to this epidemic. 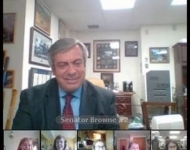 September 26, 2018 - Sen. Browne speaks with Mrs. Willets’ 6th Grade Cyber class, answering questions about his role in the General Assembly and state government. 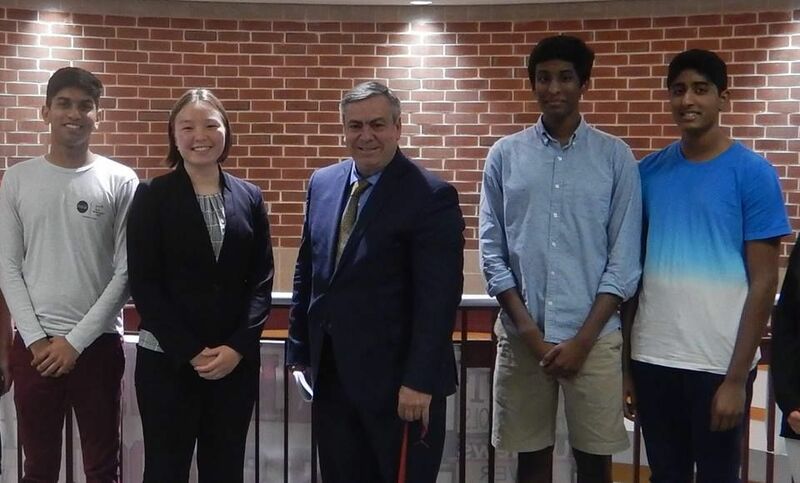 September 20, 2018 – Sen. Browne takes part in the beam signing of the new 13-story City Center 5 Building in Downtown Allentown. 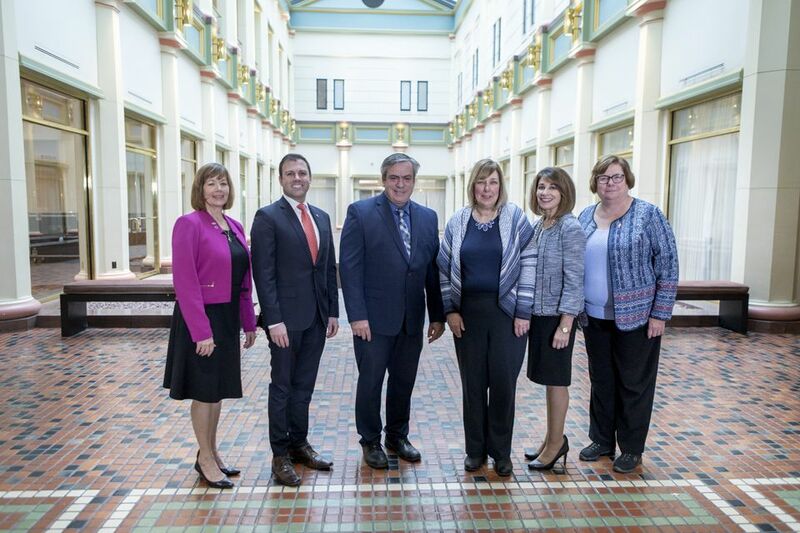 September 12, 2018 – Senator Browne welcomes ESSA Bank and Trust to their new location in Allentown. 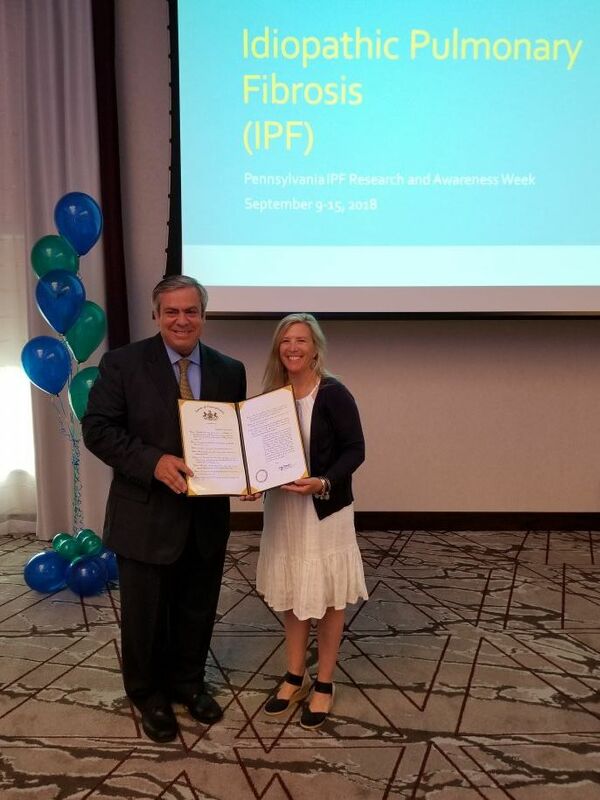 September 10, 2018 - Senator Browne was the author of Senate Resolution 401, declaring September 9-15 as Idiopathic Pulmonary Fibrosis (IPF) Research and Awareness Week in Pennsylvania. 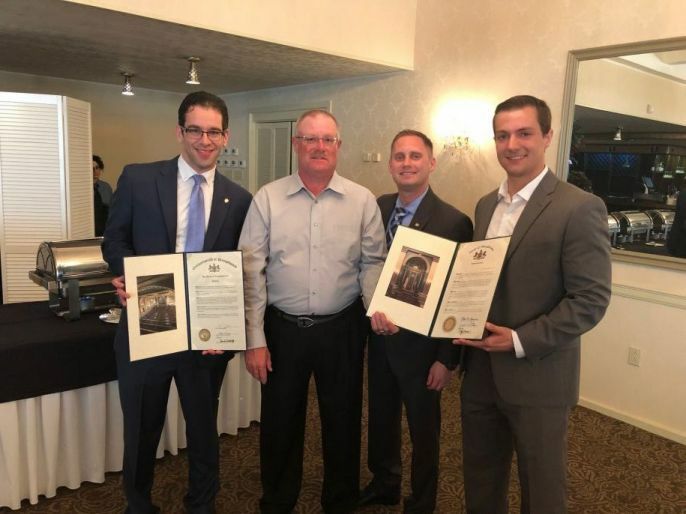 This resolution was designed to bring awareness to this debilitating and generally fatal disease, its symptoms and the great work of the IPF community, including the Wesco Foundation. 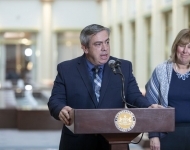 Pictured Left to Right: Sen. Browne and Jen Wescoe, Executive Director of the Wescoe Foundation. August 25, 2018 - Sen. Browne speaks to a crowd at the Queen City Municipal Airport’s 75th anniversary celebration and presents a Senate Citation to commemorate this milestone. 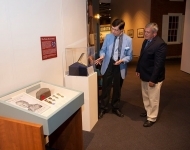 August 7, 2018 - Sen. Browne Tours the State Museum’s Purple Heart Display as part of Purple Heart Day in Pennsylvania. Senator Browne’s legislation, Senate Resolution 394, designated Pennsylvania as a Purple Heart state and established August 7th as a day of remembrance. 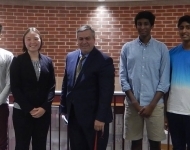 May 21, 2018 - Sen. Browne met with the Parkland High School Political Science Club, answering questions posed by students about public service and community involvement. May 4, 2018 - Sen. Browne helps to cut the ribbon on Tower 6, the new 12-story, 180 foot tall, office building in Downtown Allentown. April 19, 2018 - Matt Szuchyt (Right), Sen. Browne’s Local Government Liaison, presented a Senate Citation to retiring Woodlawn Fire Chief, Russ Held (Center Left), in honor of his 36 years of distinguished service. Also Pictured is Rep. Mike Schlossberg (Left) and Rep. Zach Mako (Center Right).